The most significant of the new sanctions announced in Bolton’s speech was a measure aimed at impeding Venezuela’s exports of gold, which have become an important source of foreign exchange for the country’s crisis-ridden economy. US officials claim that Venezuela has exported some 20 tons of gold to Turkey, a NATO ally with which Washington has come into increasing conflict. Caracas and the government of China also recently signed an agreement to develop what the Venezuelan government termed a strategic alliance to develop the country’s gold-mining sector. 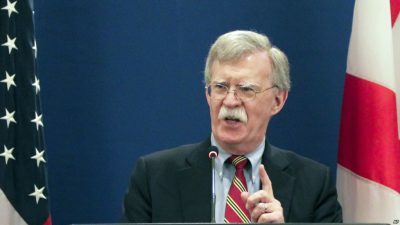 In a question-and-answer period after the speech, Bolton indicated that the Trump administration is considering implementation of a section of the 1996 anti-Cuba Helms-Burton Law to take effect, allowing Cuban exiles in the US to file lawsuits in federal courts against companies doing business involving properties that were expropriated in the wake of the 1959 revolution. The measure has been routinely waived for over two decades because of its extra-territorial reach. While no new sanctions were announced against Nicaragua, Bolton advanced the same kind of charges and demands for regime change leveled against Cuba and Venezuela, vowing that the government of President Daniel Ortega “will feel the full weight of America’s robust sanctions regime” with measures coming “in the very near future.” Until now, Washington has exhibited a certain ambivalence toward the government of the Sandinista leader, who returned to power in 2007 on the basis of an economic program geared to the interests of Nicaraguan and foreign capital. Among Bolsonaro’s attractions for the US administration – aside for the affinity between the fascistic views of Trump and the Brazilian president-elect – is his vow to pursue a policy aligned with that of Washington and against the influence of China in the hemisphere. During the Brazilian election campaign, he denounced Beijing for attempting to “buy Brazil” and even made a provocative trip to Taiwan last February in an affront to the “one China” policy recognized by Brazil since the 1970s. Behind all the posturing about “human rights” and the refusal to tolerate “despots,” US policy in Latin America is driven ever more openly by its strategic conflict with China, whose influence has steadily grown in a region long regarded by US imperialism as its “own backyard”. Once again, US officials are invoking the Monroe Doctrine and Washington’s supposed “right” to intervene to prevent “outside” powers from poaching on countries it regards as semi-colonies. Even so, as Bolton was making his speech in Miami, the presidents of both El Salvador and the Dominican Republic were both in Beijing meeting with President Xi and other top officials, while China and Panama announced on the same day that Panama City would host a China-Latin America Caribbean Business Summit next year, focused on promoting economic-commercial cooperation between both regions. To the extent that the influence of China’s trade and investment challenges that of the US, Washington will respond with increasing provocations and militarism.